The Opinionated Pussycat: It's Elvira's Wonderful Life! Good afternoon felinity assembled....Elvira Mistress of Felinity, here. Daddy has been online a lot, in recent weeks, during the hours before he heads to work, mostly doing some blogging related to his bike riding. However, there have been some things he and I both have been working on as we prepare for an eventful June and this blog hopefully returning to some semblance of what passes for normalcy around here, hee, hee! As this blog celebrates its 110,000th Page View, since it debuted New Years Day 2010, this morning, I have some things to share. We're Back and Meowin' to Go! We Have a New Computer and Printer! As we announced earlier Daddy Kiril will be going somewhere for 3 days, in early June, without even leaving town, or having to board us at the vet! 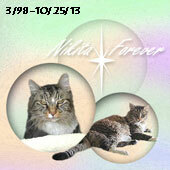 He plans to look his best and he and I have created something to allow us cats to "represent" with him, while not being able to physically be with him. 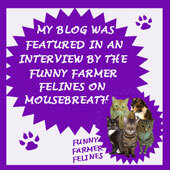 Catnip for everybody (treats for the under age and niptotallers)! Hello, felinity assembled, Elvira Mistress of Felinity, here. On Friday the 13th Daddy Kiril went shopping, thanks to the kindness of family, after some research to find a computer and printer he could look at, in store, and went to a nearby Best Buy where the Geek Squad helped set things up in the computer he chose...then he made our day by bringing it all home. 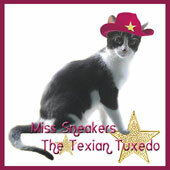 To say Sneakers the Texian Tuxedo, Friday the Bearded Lady and I were excited would be an understatement....it has been almost a year without a working computer in the home and it hurt. Daddy got an Inspiron 3668 Desktop and a nice Dell 23 in. monitor and keyboard and mouse. He also got a Brother MFC-J485DW wireless all-in-one printer. We helped him unpack everything and make sure all was in the boxes that was supposed to be in the boxes. The 2 Tuxedos DID get a little rambunctious, but nothing was damaged in the process...much to the relief of Daddy Kiril, hee, hee! Elvira Mistress of Felinity, here with big news! The Opinionated Pussycats will soon be looking our very best again! Daddy Kiril chose to use the huge 3rd quarter bonus he got and a 25% holiday discount for something he has not had for too long. It is no secret that he hated having to use his cell phone camera the past couple of years and longed for a new camera. We hope y'all ain't forgot us! Elvira Mistress of Felinity, using Daddy Kiril's cell phone still (ain't easy, trust me! 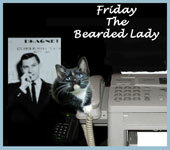 ), here to, along with Sneakers the Texian Tuxedo, Friday the Bearded Lady and Daddy Kiril, wish everyone a very Meowy Chrissymouse! While daddy has still been unable to get his laptop fixed there are a few things to report of a positive, creative nature. This past week, on his bike rides to work, daddy saw lots of cats for the first time in months, and has some pictures we hope to share soon. Daddy got a huge 3rd quarter bonus at work, a few weeks ago, and made the decision not to use it on fixing the laptop. He instead chose to use it, along with a 25% holiday work discount, to get a brand new camera, his first in a couple of years. While he now needs to upgrade to a new cell phone because of this, and get the laptop fixed, before he can use it, he felt it was an important step to take as we move into 2018. We are going to try to post more using a combo of cats on the cell and daddy at the Library if his visit this week works as we hope. It's me, Elvira Mistress of Felinity and I apologize that another month has gone by without Sneakers, Friday or I posting. Daddy Kiril has still been unable to get the technical issues with his laptop fixed so I am reduced to struggling with his cell phone again. I was very touched that some of you remembered my Gotcha Day, earlier this month, and I thank you from the bottom of my furry Tortie heart. The big news, and it hurts to not share photos, is that Daddy spent today at the opening day (free admission!) of the 40th annual Houston World Series of Dog Shows, at NRG Center. 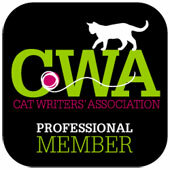 The purpose was to not just have a relaxing time checking out the dogs, but to discover any local organizations with cats on their agenda that we could add to our resource pages. The most interesting development was that he chatted with and gave our card to, a top representative with Houston Pet Talk Magazine (http://www.houstonpettalk.com )! One thing led to another and due to her interest he invited her to visit our blog and explore it. Yet, I am embarrassed to have someone so prominent in the Houston pet community have their first taste of us when it has been weeks since we have been able to regularly blog, or use the laptop for any online activity and we have no idea when that will change or the cost involved. Ah, welll...it is all in the paws of Ceiling Cat. Take care, friends...we will get back to normal as soon as we can. I wanted to let everyone know that I have been working on a few new 200 word stories and had planned to post them this week and next, but Daddy Kiril's laptop had modem issues last week and when he got the new modem his AVG anti virus seems to want to block his new network connection. We are using his cell phone to get online and trying to use that with my paws ain't easy! Anyway we hope to get back to normal soon! Elvira Mistress of Felinity, here, welcoming the start of Summer and, coincidentally, the start of the Hurricane Season in the Atlantic. This means we kitties need to look our best for when the big bad storms arrive. As May came to an end we had a preview of sorts. A couple of hours of late night rain, with almost non-stop thunder and lightning. Daddy Kiril was late getting home by an hour! This 5 min. video by daddy, from outside where he works, gives you an entertaining taste of what we saw out our window as we waited for him to get home. Anyway, I got the urge to go through old photo folders, looking for pics we never used for some reason and the earliest ones I found were these 2 from early June 2012. I really love the top one! In the bottom one I appear to be practicing my laser eye, hee, hee! 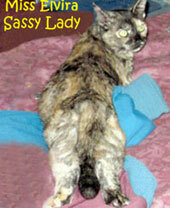 We send our purrs and purrayers to Rascal! He got an infection, turned abscess on his cheek, most likely from a cat fight, but all is well according to his Human. She said "the vet fixed him up and he's recovering nicely. Though until the cone of shame comes off, he might tell you different."